Fahrenheit is the fat burner for women that claims to be a major breakthrough in fat loss. Fahrenheit uses a super-thermogenic compound that raises metobolism whether you are at rest or at play. As we age our body’s metabolic rate slows down making it harder for us to naturally get rid of excess calories and convert fatty deposits or fat storage into fuel for our body. A7-E Super-Thermogenic Gel ™ 30/500 [lauoyl macrogo-32 glycerides, p-methylcarbonylethylphenol, Sclaremax ™ (Proprietary sclareolide), 3,17-dihydroxy-delta-5-etiocholan-7-one diethylcarbonate, yohimbine HCI, piperine], caffeine. Other Ingredients: Lauroyl macrogol-32 glycerides, gelatine, FD&C red 40m FD&C yellow 6, titanium dioxide. Not exactly the most natural ingredient list we have reviewed! Expectant or breastfeeding mothers should avois, as should anyone under the the age of 18 years of age. User comments are less that flattering. Does not appear to have in the way of clinical dat attached to it. Either from the official website or a multitude of independent third party websites that stock health and diet products. Capsiplex – the fat burner that is constantly featured in the press, largely due to its ability to burn 278 calories per day while doing relatively little. 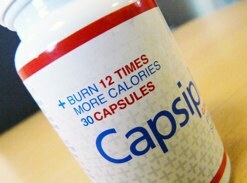 Capsiplex sold out completely when it was first introduced to the market and has sold in excess of 1 million bottles. Capsiplex is called the “miracle slimming pill” and contains an ingredient found in NHS prescription only slimming tablets.